Sixteen people signed up for Andy Willgruber’s Jump Mountain hike this fine fall day (Katharine Maus, Lee Wenzler, Lindsay Brown, Pete & Bev Fink, Dave Abdallah, Jodi Frederiksen, David Crowe, C.J. Woodburn, Clai Lange, John Brandt, Kelly O’Rourke, Dave Borszich, Marian Styles, Iva Gillet, and Bill Holman). A pretty drive led us to a parking area just west of Goshen Pass. Perhaps invigorated by the weather and scenery (or perhaps being gluttons for punishment), no one joined Bill for a 5-mile substitute to this strenuous route. A swaying cable bridge over the Maury River launched the hike with a bit of excitement. Only three people at a time can safely cross, and everyone avoided taking an unauthorized swim by not stepping into the void left by a missing slat in the floor of the bridge. Today’s route is in the Goshen Pass Natural Area Preserve and the Little North Mountain Wildlife Management Area. Of several lovely views during the hike, two proved stunning: one overlooking Lake Merriweather, and the other a nearly 360-degree view from Jump Rock (more than 3,000 feet high). Jeff Monroe, who sadly was not with us today, described the view in his blog as including the Shenandoah Valley and Great North Mountain all the way to Buffalo Gap, with a glimpse of Elliot Knob behind Little North Mountain. Course that elevation meant that we did a lot of climbing throughout the day followed by a lot of descending. This was not a hike for weak knees. The elevation change was 2,600 feet and was about 8 miles. We finished hiking at 5 p.m. after navigating the bridge once more. A few people stayed in the area to camp, some went directly back, and some talked about stopping for refreshments. What is the best thing to do on a spectacular fall day? Take a hike, of course! October 18 was the scheduled Delfosse Winery Trails hike and 22 participants joined hike leader, Marit Gay, at the vineyard in Faber. 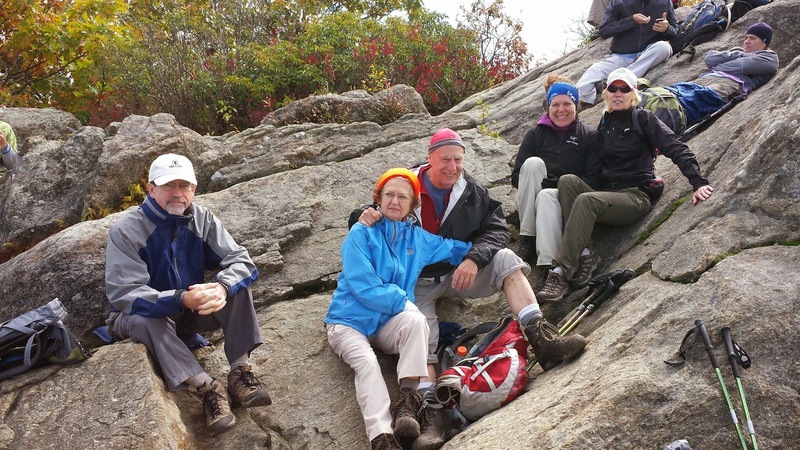 Bill Holman assisted in preparation for becoming a new hike leader for Charlottesville PATC. The group carpooled to the location, which is 35 minutes south of Charlottesville. The initial climb from the parking area at the tasting room, was steep - over 800 feet in elevation, and a good way to warm up our legs. After passing through the gate from the vineyard to the wooded private Delfosse trails, the group spent the next 2+ hours hiking the path partially created and maintained by the Nelson County Parks and Recreation. This 5.5 mile loop is open to mountain bikers and horseback riding as well. Trail runners also enjoy it and we met three runners - possibly preparing for the upcoming 10k race. The terrain is rolling, providing for a fairly strenuous hike with over 1,400 feet in elevation gain. A good workout for a fairly short hike. We stopped briefly to enjoy pumpkin chocolate chip cookies and then finished the outing with lunch gathered by the pond. Some of the participants partook in glasses of wine and also wine tasting offerings. The setting was ideal for a warm, autumn afternoon in full color. Thanks for coming out to hike including Iva Gillet, Catherine Miranda, Leon Gorman, Emerald Young, Rita Kieffer, Jeanne Siler, Bev Fink, Dave Borszich, Rich Bard, Marian Styles, Kyle Lampe and Maxwell the dog, Michael Seth, CJ Woodburn, and Linda Ginsberg. Nine intrepid hikers met at Gravel Springs Gap parking area on the Skyline Drive for the Big Devils Stairs adventure hike. Hike leaders Pete Fink and Marit Gay had envisioned the hike down Big Devils Stairs Trail with a return up the old trail through the gorge and bushwhacking to reunite with the existing trail. 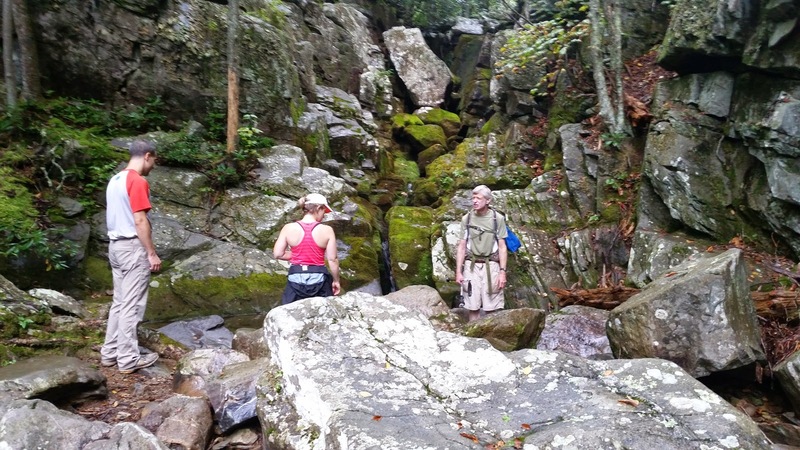 Rainy conditions from the last three days altered the plans, but a wonderful fall hike was still enjoyed by all. 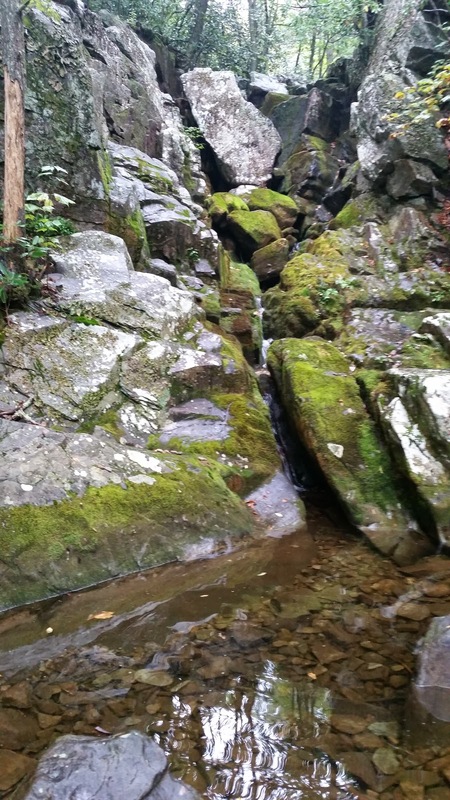 Instead, the group began the original plan by taking the yellow blazed fire road/horse trail to the Bluff Trail and continuing down the Big Devils Stairs Trail and eventually meeting with the stream bed and Shenandoah Park boundary. Very slippery rocks made the one mile ascent up the gorge too dangerous, so we did an out and back 6 mile hike with an elevation gain of 1800 feet. Rain held off for most of the hike and lifting fog allowed us to see some of the amazing views. Seventy degree temperatures and strong, soothing winds made for a magical day, despite the heavy rains on the ride to the the trail head in the morning. Nice surprise! Laugh of the day - Bev accidentally put on two different boots and did not notice it until the end of the day! Our meeting place (Albemarle High parking lot) was full of cars, but in a few circuits around it, Marian Styles and I saw no hikers and were about to leave when John Brandt rolled up. So only three of us headed out in light rain. Weather.com forecast no rain after 10 a.m. in Churchville, so we hoped for the best. We stopped in Churchville to verify that no one was meeting us there and shopped for a corn dog, chicken, and fuel. The directions to the trailhead sounded quite complex, but aided by memories of past trips, reaching the trailhead was fairly simple. We met leader Michael Seth and Mike Smith and headed up. Unlike the majority of times Charlottesville Chapter has taken this route, we headed up Wild Oak Trail first, because it seemed before that this direction was less steep. However, Grindstone Mountain still seemed appropriately named. Although the rain stopped, the fog remained, so we saw virtually nothing from some excellent overlooks. As usual George Washington National Forest has many fewer invasive plants than SNP, but we did spot what we thought were only a few oriental lady's thumb. We started pulling them, until Marian went a little further and saw the infestation was too extensive to remove without disrupting our plans. After about 3 hours of strenuous climbing, we finally reached the highest point of the day and started down to find the area where we were going to help overseers Lynn and Malcolm Cameron keep Grooms Ridge trail easily passable. We clipped away with loppers and hand clippers until Marian reported that we would do more good attacking thicker growth further on. After a little more work, we decided that a long drive to a long hike with lots of clearing was making for a long day, so we moved on. John Brandt could not resist trying his saw on a large tree that had fallen across the trail, but soon decided that a warm, dry house that night sounded better than a cold night on the mountain with a large blowdown removed from the trail. We met up with the Camerons, who had started working along the trail from the opposite direction. Marian and I then headed off and tackled a very steep climb to what is normally an excellent overlook. Rather than waiting for the Camerons to drive us from the end of the trail to our car, we walked the mile back then drove back to the end of trail to reconnoiter with the others. They were happy to hear that the trail was passable, even though like most trails, more could be done. The eleven energetic athletes Michael Seth, Jeanne Densmore, Charles Staples, David Crowe, Virginia Masterson, Pete and Bev Fink, CJ Woodburn, John Brandt and Kelly O’Rourke, enjoyed a beautiful ~ 9 miles with an elevation gain of +2,459 (according to Kelly’s smarty-pants phone-no guarantees on accuracy). We ascended up to the very chilly, but pretty Mary’s Rock where we were met by the other group of hikers lead by Bill Holman. On the way down Buck Ridge trail, CJ counted over 518 (her estimate of ~ 550) stairs! We all agreed that it was the longest stretch of continuous stairs we have encountered in the SNP! A big THANK YOU to the folks who built and maintain this stretch of trail!! As usual, a great time was had by all. On a beautiful September Saturday hike leader Dan Ralston led 14 people on a very scenic 10 mile loop in the South District of the SNP. Hike #21 in the PATC SNP Circuit Hikes book. Nine strong hikers converged near Lexington to tackle a true wilderness trail and celebrate the 50th anniversary of the Wilderness Act. Hikers included 7 from the Roanoke Appalachian Trail Club and Marit Gay, Jeff Monroe, and Gracie the Fabulous Hiking Dog from the Charlottesville Chapter of the PATC. This group answered the question, “What if you schedule a hike and arrive to find no evidence of a trail?” We bushwacked through the woods until coming across faint evidence of the trail alignment suggesting the Crane Trail, and followed that until it became a real trail climbing Rough Mountain through the Rough Mountain Wilderness. This remains a trail best hiked with someone who has been on it before, and we minted 8 new veterans to the small list of folks globally who have experienced this nice trail. After summiting Rough Mountain (clipping back vegetation as we moved), we continued on the Crane Trail over the mountain’s western slope, treated to views of the Cowpasture River Valley and Beards Mountain in Douthat State Park. While the Roanoke group turned around about halfway down to gain more time for a leisurely lunch at the mountain's summit, the Charlottesville-based group (Jeff, Marit, Gracie) showed their toughness by following the trail until it reached private property near Route 42. The western slope portion of the trail was in great shape, strongly indicating that local landowners see the Crane Trail as their own private entryway to secluded wilderness. Lucky folks! On an overcast morning, a five showed for this short hike which had been selected when expecting a warmer day. We started at Slacks Overlook with a few drops of rain. After a while, the rain stopped so we removed jackets. As expected, the stream we crossed had little water, but we nevertheless detoured to the falls. We proceeded back to the Slacks Overlook for lunch before heading home under dry skies, and returned in time to avoid foot ball traffic. Over summer, members of Charlottesville Chapter have performed several AT maintenance trip reported below. Work trips at home delayed the reports. We received a message asking for help with the AT over Bear Den Mountain where an overseer found he had twice as much trail as he expected because of the resignation of another overseer. District Managers Mark Gatewood and Don White helped with brush cutters and mowing. I said that Charlottesville Chapter would help with the remaining grassy growth. I was pleasantly surprised to see Dave Borzich and Brad Young show up because they have been excellent crew members. As promised, Andy Willgruber showed up with plans to mow his section of AT north of Beagle Gap, and then cross the road to mow the short open section immediately south of Beagle Gap. However, the mower he planned to use was not back from maintenance so our plans changed some. Andy went to clear overgrowth on the access road to Little Calf Mountain summit, a project he and the chapter started 11 years ago. Dave offered to use one of the weedeaters. There was a helpful note explaining how to start the machine which gave me trouble a month previously. It did not want to start, but Dave had the touch. We found an unexpected problem, that the bucket holding my fuel container had tipped over, and because the pouring spout was not in place, even with the cap in place, the container leaked into the trunk of my car. Brad used his army training to use a Swiss Army knife to some string to the trunk lid and then tie a knot so that the trunk could stay partially open to allow fumes to exit. We cut the open section of trail at the foot of Bear Den Mountain, which probably would have been faster with the mower, but was still relatively fast with each of us cutting one side. Once we were in the trees, there was little to cut so I shut off my machine for a while, until we came closer to the summit and open areas. At the top, the trail is on roads at times, but later returned to regular trail. This was the time when my machine ran out of fuel, and after retrieving the fuel can, found the same happened to Dave a minute later. Soon after we saw that the trail had been cleared, and I encountered a yellow jacket so we turned around. When we met Brad, who had been cutting small branches, we had lunch, and did a little more trimming on the way down, widening the first grassy section. Just as we reached the car, we saw Andy. We decided to cut the grassy section from the road to the woods. The mower would have been a more efficient tool than two string trimmers, but waiting would have left more people to walk through a trail section that needed clearing and require Andy Willgruber to spend hours coming back. While Dave and I cut the grass, Andy and Brad went looking for any other clearing a little further along the trail, but found little to do. Creek Overlook, so this day was an effort to make up for the small showing. This was a historic trip, the first trail work trip labeled a Flying McLeods trip without crew leader Mark Gatewood. District Manager Don White was in charge, and joined by a veteran of the Little Calf Moutain relocation and a new trail maintainer, and I carried the flag for the Flying McLeods. Instead of the regrading we expected, installing rock steps at a switchback became the main task of the day. There was the usual hunt for good rocks, contemplation of how they would best fit our holes, and then trying to make them stay in place. It was a long day which almost disrupted evening plans. To keep a short section of trail at McCormick Gap relatively free of oriental ladys thumb, I headed off with a bag to fill with weeds. Because of previous efforts, the beginning of this section of trail had relatively light growth of this invasive plant, so I pulled what I saw to keep it that way, hoping one day to move further up the hill into the overgrown area. After a while, my back and boredom said I had done enough, and several hikers mentioned a blowdown that was inconvenient to get by. On my way, I met David Dalley and his wife who mentioned the superb wilderness first aid performed last year by Dan Ralston and Jeanne Densmore. She also mentioned slipping on a log waterbar, which is another reason the Flying McLeods like to regrade trails to reduce the need for waterbars. The blowdown was indeed a nuisance, but it was fairly small, so clearing it did not take long. A couple of known bittersweet patches had pleasingly little regrowth after previous clearings. I stopped at McCormick Gap to pull out some poison ivy which was perilously close to the trail, and then headed straight home to shower. How do you pull up poison ivy without getting a rash? Carefully. And wear vinyl gloves and a synthetic long sleeved shirt. Plans to do some clearing at Rockfish Gap the previous week were altered by blowdown removal so this week I stopped at McCormick Gap. A few water diversions needed more excavation; the soil did not pack down well because the soil was so dry, but perhaps leaf litter on the new trail surface helped protect it. I removed some Oriental ladys thumb and a little bittersweet before rain provided a good excuse to head home. After the major summer growth cutting in June, enough plants regrew sufficiently to warrant more cutting. Marit Gay and Mark Perschel and I came from Charlottesville and Michael Seth met us at Rockfish Gap. We all headed south from McCormick Gap, with Michael and Marit going ahead picking some oriental ladys thumb and clipping shrubs and branches, while Mark and I each cleared a side of the trail with string trimmers, cutting normal summer growth, and hoping we reduced future growth of some invasives. Based on his expertise, Mark showed a way to load the string trimmer heads with one long piece of string. Michael and Marit decided to walk all the way to Rockfish Gap to pick up the car left there, and Mark and I, after reaching one of the side road on the trail, decided we had done what we hoped to, and took the road expecting it would lead us to Skyline Drive, as it did. As we were walking along the road, a young man turned around to offer us, dirty and sweaty, a ride. He too has volunteered for projects elsewhere and was grateful for trails here to hike. Just as Mark and I arrived back where we had left some equipment, the others in our group showed up. From there, Marit and Mark headed to their section of trail, while I went to Rockfish Gap to cut growth at the end of the trail, kill a little bittersweet and pulled at little more poison ivy. September 20 Ivy Creek redux; Flying McLeods and Acme Treadway Company. The day was a language lesson for some, learning the meaning of redux. We had a large crew, including South District managers Don White and Mark Gatewood, a couple of veteran maintainers from far north and two relatively new maintainers. Marit Gay and I represented Charlottesville. Don and his veterans from Acme Treadway Company improved the rock steps built a month earlier while the rest of us did classic slough and berm removal to slow erosion. The long dry period caused dust to fly when we tried to tamp down earth. At the end, we had a long section of flat, correctly graded trail, the longest section I have seen since the relocation at Little Calf Mountain. The rock steps were indeed nicer to walk than the previous month. Because we finished at classic Flying McLeods' hour, some of us stopped at Lafayette Inn in Stanardsville to have a snack courtesy of Don White.